Is going Classic the way forward for BlackBerry? BlackBerry's next phone looks like a return to the golden days, but is that what will save the troubled Canadian phone maker? BlackBerry may have just given us the odd-looking Passport, but the next device in line is a return to form, according to some new images and a few leaked specifications. The BlackBerry Classic, rumoured for a November release, packs a four-row keyboard and standard five-button navigation belt. Alongside a rumoured 1.5GHz dual-core chip, there's 2GB or RAM, 16GB of storage and an 8MP rear-facing camera. 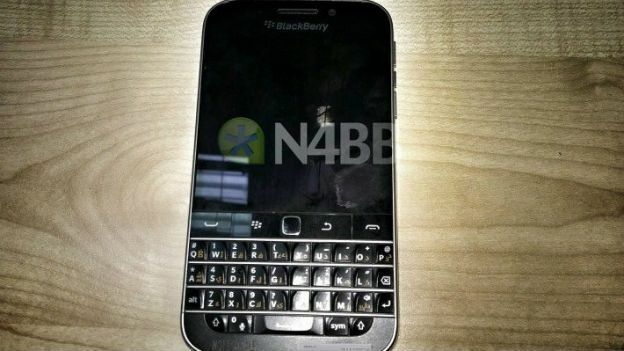 That's according to N4BB.com, which also hinted at a 3.5-inch 720p screen and a return to the business-focused, classic look of earlier BB handsets. Bringing mobile email and a QWERTY keyboard to boot meant that Research in Motion's 2003 BlackBerry 7230 was the new must-have tool for business folk. The colour screen offered a 240 x 160 pixel resolution and a massive (at the time) 16MB of internal memory. BlackBerry's first device to come with a camera used a modified QWERTY keyboard that looked more like other smartphones at the time back in 2006. It was also the first phone from the company that allowed music playback and supported a microSD card for expanding storage. By 2008, BlackBerry was riding highand the Curve came to encompass everything about the brand. The QWERTY keyboard was back as well as a new focus on security and encryption and BlackBerry's trackball was made more durable. The glossy black finish was proper "bizness", but BlackBerry concentrated on making the chassis thinner and lighter with a better battery life. Over the next five years BlackBerry was left in the dust by the likes of the app-rich Apple iPhone models and the affordable Samsung devices. BlackBerry tried to get in on the action with the touchscreen-only Z10 that aimed to show off the company's new BB10 operating system. And while web browsing and the phone's camera were praised, the chronic lack of apps and shaky interface meant Apple and Samsung won out again. Throwing a curveball to the smartphone world with a square design, the Passport got its fair share of media attention. BlackBerry pitched it squarely at business "power users" with an email hub and remote access. But there's flagship specs and a decent camera to be had for the rest of us, if you can get past that, ahem, unique design.